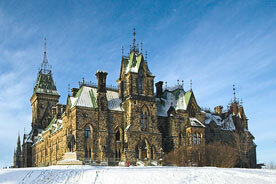 The photo at right shows the Canadian Parliament building in Ottawa, Ontario. The snow-covered ground suggests that this picture was taken on a wintry day. 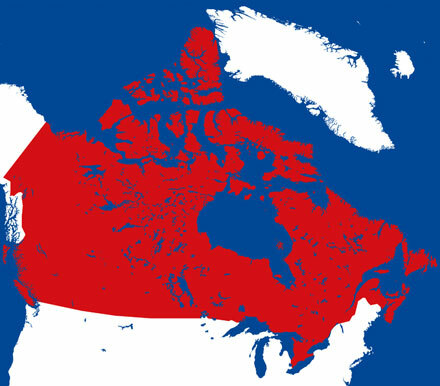 Canada spans a large part of North America, but most of its residents live in cities and towns within 200 miles of the United States border. Beyond is a vast natural backyard with topography that varies from mountainous terrain to flat, icy tundra. Canada's provinces have a variety of "getaways" to offer, from tourist attractions such as Niagara Falls in Ontario, to quaint islands such as Prince Edward, to the rough uncharted territory of "Wilderness Canada". Outdoor recreational activities include bicycling, camping, canoeing, hiking, boating, horseback riding, mountain climbing, skiing, white-water rafting, and fishing. Also prevalent are the many festivals held throughout the calendar year, celebrating everything from seasons to types of music. The arts are alive and well throughout Canada's towns and cities, and Canadians pride themselves on the fact that their cities are clean, safe, and lively. Local dining specialties include lobster, mussels, salmon, sole, game meat, and native cheeses from Quebec and Ontario. Although Canada's official sport is lacrosse, the dominant sport of the country is hockey. Canada's six teams include the Vancouver Canucks, Calgary Flames, Edmonton Oilers, Toronto Maple Leafs, Ottawa Senators, and Montreal Canadians. Canadians are extremely passionate about their sport; season tickets to the Toronto Maple Leaf's games require a seven year waiting list. In addition to hockey, curling is a sport that many Canadians excel at. It was invented in Scotland and looks like bowling, except played on ice with 40-pound hunks of polished granite. Many Canadians participate in local curling leagues. 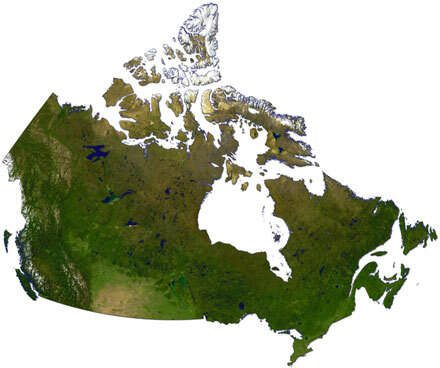 The mildest weather in Canada is during the June-September period, when tourism is at its peak. May and June may be a less crowded period to visit more temperate areas of Canada. Amenities range from luxury resorts to campgrounds for those who like a bit of adventure. Provinces such as Prince Edward Island host many family-owned bed and breakfasts. When traveling, be sure to check ahead for reservations, as some provinces shut down accommodations during the winter. U.S. dollars are accepted in much of Canada, but to attain the most favorable exchange rate, it is best to exchange some of your money into Canadian funds at a bank or financial institution. Canada's diverse provinces hold something of interest for every type of traveler. When planning your Canadian vacation, be sure to check out the World Wide Web to research weather forecasts, plane tickets, hotel rooms, rental cars, vacation packages, and more. Happy traveling! Government of Canada - official government website. City of Ottawa - website of Canada's capital city. Parks Canada - Canadian National Parks website. Canada.travel - Canadian Tourism Commission.